Cities across the country need more housing but aren’t building it. In California, this challenge has become a crisis. Despite the state’s booming economy, which recently surpassed that of the United Kingdom to become the world's fifth largest economy, California is struggling with record levels of homelessness and has lost more than one million residents to other states over the past decade as middle and low income families flee the highest-in-the-nation housing costs. In response, politicians and policymakers are considering dramatic changes, which could have profound effects on the planning, design, and development of cities across the state. For planners, architects, and designers this presents opportunity to rethink our role in shaping how our cities grow and change. At the root of the California housing crisis is a fundamental principle of economics: supply has not kept pace with demand, causing more competition for few housing units units and driving prices up. While domestic migration has gone negative, California’s population and demand for housing continues to grow, thanks strong international migration and and new household formation, as more millennials enter the housing market. Despite the increase in demand, the Next 10 housing study finds that over the past decade only 25 housing permits were filed for every 100 new residents in California. Overall, the state Department of Housing & Community Development has concluded that just to match population growth, California needs to build 100,000 more homes each year than we do now. Home-building isn’t driving population growth—it’s lagging behind—and not building housing won’t stop cities from growing. The good news is that while California needs more housing, we also have the space for it. 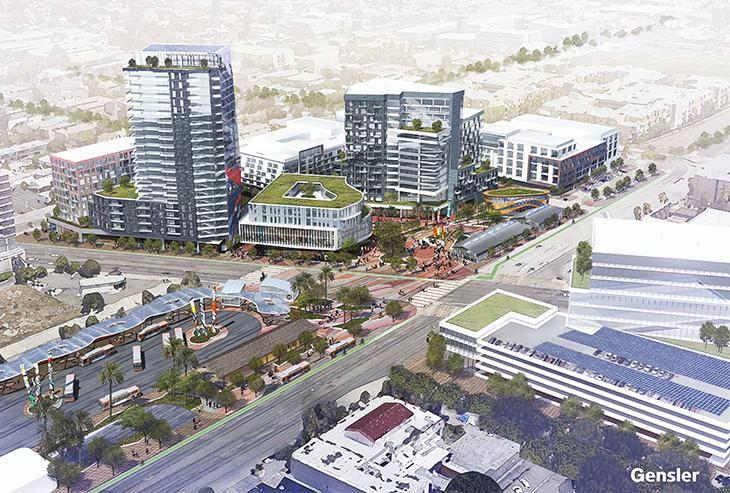 A 2016 study by McKinsey concluded that California has enough land within a half-mile of transit stations to construct three million new homes over the next two decades. With Californians across political lines voting to tax themselves to fund new transit expansions (including Measure M here in LA), the potential for development in transit-oriented communities will only increase. And it’s essential for realizing the value of our infrastructure investments. With the space to build up to 150,000 housing units per year near transit stations, solving the housing crisis doesn’t require embracing sprawl or abandoning California’s commitment to reducing greenhouse gas emissions; in fact, we can’t address climate change without building more housing in urban centers. Zoning restricts density and may prohibit multi-family residential development entirely. Floor-Area Ratio (FAR) Maximums limit the size of buildings in relation to the size of the site. Parking Requirements increase building costs and use space that could otherwise provide housing. Height Restrictions limit the number of floors that may be built. Together these requirements limit the number of new housing units that can be built and increase the cost of those units that are constructed. In addition, neighborhood opposition often forces architects and developers to further reduce the size—and therefore the benefits—of housing projects near transit. For many housing developments, from transit-oriented communities to permanent supportive housing, the biggest challenge isn’t architectural—it’s political. As architects and designers, we believe in the power of design to create a better world. Realizing that vision may sometimes involve need to be more engaged in crafting the laws, regulations, and policies that shape our cities, from the state capitol to neighborhood councils. Eliminated FAR Maximums in high-quality transit areas. Abolished Parking Requirements in high-quality transit areas. Lifted Height Restrictions to allow at least four-story buildings in high-quality transit areas. While these proposed changes sparked vigorous debate among municipal governments, environmentalists, labor groups, and others, architects and designers were largely missing from the discussion. Although the SB 827 was ultimately not advanced by state lawmakers, it did change the debate on housing policy in California and became a rallying point for a new coalition of pro-housing advocates that has outlived the bill’s demise. From From San Francisco to Orange County, YIMBY groups are forming, as residents fed up with the lack of housing get together to say “yes in my backyard” to new residential developments. Similar groups can be found across the country and in major cities around the world. Contact your elected officials and support policy changes that make it easier to build new housing. By joining the debate over development in the cities where we live and work—and supporting more housing in urbanized areas with access to transit—we can help ensure our communities continue to have homes, jobs, and opportunities for everyone. Jaymes Dunsmore is an AICP-certified planner and urban designer based in Gensler’s Los Angeles office and the Cities and Communities Regional PA Industry Expert for the Southwest Region. A founding member of People for Housing, an Orange County-based non-profit organization, Jaymes is an advocate for sustainable, transit-oriented, urban development. Contact him at Jaymes_dunsmore@gensler.com.